The Nebraska Kennel Club held Tracking Tests on Nov 13, 2016. One Tracking Dog (TD) and fiveTracking Dog Excellent (TDX) tests were run, with a "Pass" achieved on the Tracking Dog test. Click the link below to view photos from the event. 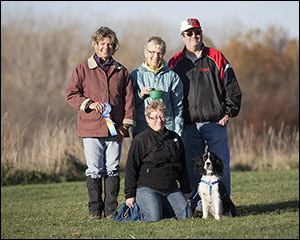 CONGRATULATIONS TO Sheila Koon & Kathy Patregnani and Vinewood Bright Lights N Actions on their new TRACKING DOG TITLE!